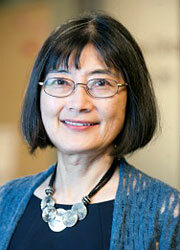 Dorothy K. Hatsukami, PhD, is the Forster Family Chair in Cancer Prevention at the Masonic Cancer Center of the University of Minnesota and Professor of Psychiatry. She is the Associate Director of Cancer Prevention and Control at the University of Minnesota Masonic Cancer Center and Director of the Tobacco Research Programs. Her areas of expertise include nicotine addiction and its treatment, including testing medications such as a nicotine vaccine and combination medications, in smokers. She has over 400 publications and is currently PI/Co-PI of two large NIH-funded cooperative agreements that involve assessing the toxicity, appeal and addictiveness of various tobacco products. She has served on numerous scientific advisory boards for the U.S. government including the 1) Food and Drug Administration, Tobacco Product Scientific Advisory Committee, 2) National Advisory Council on Drug Abuse, 3) Interagency Committee on Smoking and Health, 4) Substance Abuse and Mental Heal Services Administration, 5) Scientific Board of Counselors for the National Institutes on Drug Abuse, and 6) the Drug Control Research, Data and Evaluation Committee of the Office on National Drug Control Policy. She is currently a member of the World Health Organization Study Group on Tobacco Product Regulation. is the Forster Family Chair in Cancer Prevention at the Masonic Cancer Center of the University of Minnesota and Professor of Psychiatry. She is the Associate Director of Cancer Prevention and Control at the University of Minnesota Masonic Cancer Center and Director of the Tobacco Research Programs. Her areas of expertise include nicotine addiction and its treatment, including testing medications such as a nicotine vaccine and combination medications, in smokers. She has over 400 publications and is currently PI/Co-PI of two large NIH-funded cooperative agreements that involve assessing the toxicity, appeal and addictiveness of various tobacco products. She has served on numerous scientific advisory boards for the U.S. government including the 1) Food and Drug Administration, Tobacco Product Scientific Advisory Committee, 2) National Advisory Council on Drug Abuse, 3) Interagency Committee on Smoking and Health, 4) Substance Abuse and Mental Heal Services Administration, 5) Scientific Board of Counselors for the National Institutes on Drug Abuse, and 6) the Drug Control Research, Data and Evaluation Committee of the Office on National Drug Control Policy. She is currently a member of the World Health Organization Study Group on Tobacco Product Regulation. Dr. Hatsukami lectures on tobacco addiction, treatment, and policies.